Whether you are simply curious about yoga or already a dedicated practitioner, if you are interested in improving your fitness, making your health and well-being a priority and enhancing your quality of life, Asha Yoga is for you. We are an independent yoga studio committed to enriching people’s lives through the practice of yoga. You definitely don’t have to be active or already flexible to start! We offer a variety of styles in heated and non-heated yoga for all levels of experience. Practicing in our pleasantly heated space helps to heal and detoxify the body while allowing you to realign, strengthen and safely stretch. We invite you to try your first two classes (within a seven-day period) on us: our “Foundations” practice is the perfect place to begin. 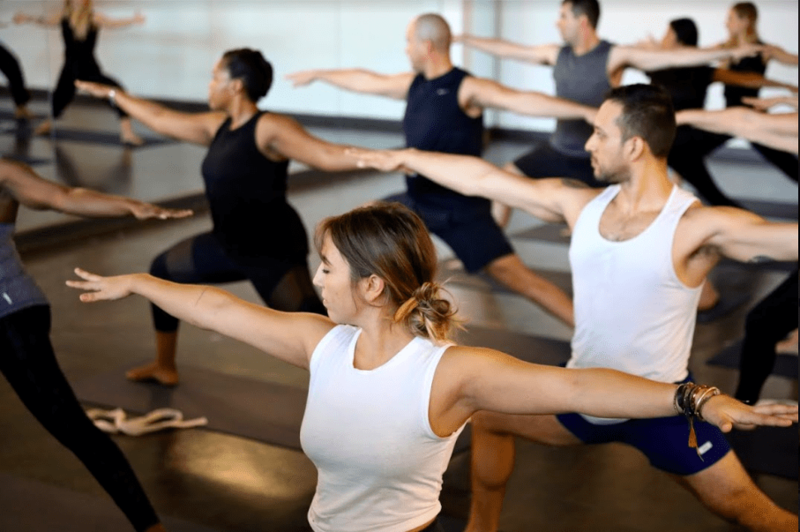 Beyond becoming stronger, more toned and more flexible, the practice we offer can greatly improve your overall health and quality of life, helping to manage stress and alleviate anxiety. A regular yoga practice at Asha will improve your well-being and help you feel amazing in your body every time you come to your mat. Gain a yoga practice and at the same time a warm, welcoming and vibrant community, which in-turn increases your motivation and happiness. New to Asha Yoga ? Learn the foundations of the Chakra Systemthrough an 8-week series of yoga postures, meditation and more! Within these classes, welearn about the seven major chakras and how wecan harness and guide this energy system to enhance our optimal health. These classes are a combination of teachingsabout the physical body through asanas, combined with emotional and mental healing and awareness through pranayama (breathingtechniques), meditation, and mantra repetition. This series will invite you to a balanced, innerstate of harmony as well as a practice to return to whenever you feel out of balance. Space is limited therefore payment must be madein full upon reservation. No refunds will be issued. All prices are subject to applicable taxes. Join Amy in a 2-hour Birth Preparation workshop, ideal for new mums-to-be (and partners are welcome)! Gain perspective about how to arrive at your birthing time confident and relaxed. Learnabout the physiology of birth, the stages of labour and how to move through with ease. Look at your rights as a birthing person and how to make choices you feel comfortable with. Partners are welcome to join in and learn what to expect during birthing time and how to best support you. Overall, we will look at how to set thatstage for a positive birth experience! Join Stephanie Tremblay for a 2-hour Restorative Yin practice, assisted by Benoit St-Pierre, certified Masso–Kiné–Ortho therapist from Azzuan. We invite you to come relax while improving the depth of your postures. The number of availablespots is limited to 25 so that Benoit can spend a fair amount of time on each participant. That being said, we encourage you to reserve your spot quickly – this class is a MUST! If you have blocks at home, we invite you to bring them with you (no need to worry if you don’t, wehave some available in-studio). Please wear a long-sleeve shirt and comfortable pants, this class will take place in our non-heated space. Space is limited therefore payment must be made in full upon reservation. No refunds will be issued. All prices are subject to applicable taxes. Yoga for kids will introduce a playful approach to Yoga for children between the ages of 5 to 8. Mini yogis will use their imagination to understand the essence of Yoga, and this class will help children improve their concentration, body flexibility and brain development. Space is limited so be sure to enrol your child today! This class is designed as a safe introduction to the practice of yoga for teens between the ages of 13 and 16. We will focus on developing clear and safe alignment in foundational poses to create a balance of strength and flexibility. Take time to reconnect and feel grounded for the week to come! Like in any practice, if you are passionate about what you do, you will always try to surpassyourself. We invite you to explore another aspect of yoga and discover arm balancing. During this workshop, we will prepare the body for postures such as Pinchamayurasana (forearmbalance), Kundinyasana (forearm balance split) and Asthavakrasana (8 angle pose). All you need to participate is your curiosity and determination. May the 4th be with you! This workshop is the perfect opportunity to giveyourself a chance to recharge, rejuvenate and renew yourself! Join Alyssa, Vickie and Irenethrough a guided practice, set with the intention of restoring and aligning the body and the breath; the mental and the physical with the combination of restorative Yoga enhanced with Reiki therapy. In our practice, we will experience stillness and gentle movement for extended periods of time, all while using the support of props and combiningmindfulness with awareness. Reiki allows the bodyto fully surrender, relax and heal, thereforeallowing better integration of the practice. Join Guillermo as he guides you through 5 specialized classes, designed to help you explore every aspect of the Ashtanga practice. From the basics to far beyond, you will explore more advanced techniques, refine your skills and acquire many new ones. Space is limited therefore payment must be madein full upon reservation. No refunds will be issued. All prices subject to applicable taxes. Join Cariné for a 7-week Aerial Yoga series designed to help you explore every aspect of thisexciting practice! From the basics to far beyond, you will learn howto become more comfortable with your practice. Explore more advanced techniques, refine your skills and acquire many new ones. Get all the info you need delivered right to your inbox once a month!